Recently got a question about customizing the GAL and my previous post that talks about it: "HOW TO: Modify Display Template to make default email address appear in Address Book/GAL". The new Details Template Editor in Exchange 2007 (in EMC | Tools) makes it much easier to modify templates and give your GAL the kind of look you want (short of adding that 5 Mb. purple bitmap file as a background and an extra-large company logo perhaps... :). Screenshots and more information about Details Templates can be found in Managing Details Templates. So, you're trying to customize the properties pages of your address lists and want to add an attribute such as ipPhone. You don't see the attribute you're looking for. Can you add additional attributes to the list? Or should you? Dave Goldman explains in Adding attributes to the Exchange details templates. Exchange Server 2003's ADUC extensions made hiding a Distribution Group's membership a trivial task, accomplished by right-clicking a group, selecting Exchange Tasks and selecting Hide Membership. As the task suggests, it hides the group's membership in Outlook Address Book/GAL. It also prevents users from clicking the + link that appears before a Distribution Group when composing a new message, and expanding the group so messages are sent individually to all members rather than the DG. The Hide Membership task available from Exchange Tasks denies Read Property permission for the Members attribute, to the Everyone group. This also prevents Administrators trying to manage the group from seeing the group's members. Hiding Distribution Group membership is not supported in Exchange Server 2007. There is no option to hide Distribution Group membership in the console, nor a single parameter you can flip using the shell. Nevertheless, you can prevent users from expanding the group in Microsoft Outlook, and hide the group's Member attribute so it's not visible in the properties pages in Outlook or OWA. The caveat - it's not a way to hide membership completely, as noted later in the post. Note, to simulate what Exchange Server 2003's Hide Membership task does, you can use the Everyone group in the -users parameter. This hides membership from the EMC as well, but the shell can still show membership using the Get-DistributionGroupMember command. Additionally, membership of the group is not revealed in the group's properties in the Address Book/GAL. If you've already used the shell to add the deny ACE, you can skip the following procedure and head to the next section. 11. Click on the "Deny" checkbox for the Read Members property so it is checked. 12. Click OK to close the Permissions pages. Once this is done, Exchange simply sends a Distributtion Group expanded/delivered to DG message in the Delivery Report, if one is requested, without revealing the group's members. Membership of the Distribution Group can be viewed in OWA (OWA 2007). As reader Bart points out, this is easily fixed by flipping the hideDLMembership attribute to TRUE. At first look, the attribute doesn't seem to be exposed by the Exchange shell. You can use your LDAP/AD tool of choice, including ADSIEdit, to modify it. The caveat: These workarounds succeed in hiding membership by examining the Distribution Group (or sending a message to it). This may meet your requirements for hiding group membership. However, you can examine the Member Of property page of a recipient and see which groups he/she is a member of. Agreed, this is not a convenient way of discovering group membership— particularly if you have a large number of recipients. Nevertheless, from a security standpoint, this does mean there's no hiding of group membership. I posted about OPATH filters recently [read previous posts 1) Adventures with OPATH: some annoyances if you're used to LDAP and 2) memberOf Attribute can now be used in OPATH filters!]. One of the issues was my inability to get a list of filterable properties that can be used in OPATH filters - unlike LDAP filters (I hate to call them legacy filters :), you cannot use *all* the attributes of recipients in an OPATH filter. Commands referenced in the documentation to get this did not work for me the last last time I checked. Last week Evan Dodds informed me the list of filterable properties should be up on his blog soon, and here it is, as promised - Filterable Properties in Exchange 2007 RTM. He warns "The rest of this blog post will be long. And boring". Not if you've been waiting for this info Evan... it's an interesting reference! There are differences in the filterable properties used by the -Filter parameter used in recipient commands like Get-Mailbox, and the properties used in OPATH filters for the -RecipientFilter parameter (for Address Lists, EmailAddressPolicies, Dynamic Distribution Groups). Both lists have been updated for SP1. 1. the ldap attribute for last name is sn (or surname, as it's known in many cultures). OPATH refers to it as LastName. Yes, many of the OPATH property names do make a lot more sense, and while these will make things easier to figure out for newbies - as Evan notes in his post, it does add some complexity for folks used to LDAP syntax, filters, and attribute names. I'm beginning to equate the OPATH property names to what "users" see in their Address Books in Outlook - simplified property names. At times you struggle with the cross-references between those simplified property names, and the actual attribute names that they map to when you fire up a tool like ADSIEdit or edit a Display Template. If you've been using OPATH for any length of time, I am certain you must have felt some of that discomfort. Evan's post and the list of filterable properties may help alleviate some of that. Frequently users report recipients missing from the GAL. So begins the mystery of missing recipients. In this case there are existing users who did show up in the GAL earlier but have disappeared now. Some recipients may not be included in the Offline Address Book when it is generated, for a number of reasons. With Diagnostics Logging for OALGenerator bumped up (in server properties | Diagnostics Logging tab | MSExchangeSA -> screenshot), the OAB was regenerated manually. Sure enough, errors were logged for the missing users. OALGen will skip user entry 'Joe Adams' in address list '\Global Address List' because the SMTP address '' is invalid. - The reason these recipients show up in the "All Users" Address List is because that Address List is not part of the OAB - only the Default GAL is, as shown in the screenshot below. Therefore, if you disconnect the client from the network, you can't see the "All Users" Address List. - The default SMTP email address of the user - as displayed on the Email Addresses tab with uppercase SMTP: was [email protected]. However, on the recipient's properties | General tab, it showed up as [email protected]. - The OAB was regenerated, and complete OAB downloaded in the Outlook client. Voilà, the missing users showed up! And thus was solved the mystery of the missing recipients. An update to the earlier post on HOW TO: Find an email address in Active Directory (Note: Content from this post has been merged with the previous post, simply click on this link to see the roll-up post on finding email addresses), which shows how to find a recipient with a particular email address using ADUC's Saved Queries feature. Replace "dc=domain,dc=com" with your AD domain name and suffix, and [email protected] with the exact email address you're looking for. In the above example, only the name field is exported. All CSVDE/LDIFDE queries also return the object's distinguishedName. To add more fields to the list, insert a coma after name and type new field names separated by a coma: e.g. This was an interesting question posed in exchange.admin today, and it's been a long while since I made such changes so it took a while to figure this out. When you go to a recipient's properties in GAL/Address Book in Outlook, the (default) email address - something you want to find quickly and many a times cut & paste somewhere - does not show up on the General tab. When you go to the E-mail Addresses tab, you see all the recipient's email addresses - these reside in the proxyAddresses attribute of the recipient. The default address appears with an uppercase SMTP:. However, you can't cut and paste anything from this tab. To modify how these things appear, you need to modify the Display Templates. This topic in general isn't documented very well or as extensively. The Exchange Server 2003 Administration Guide has a little HOW TO procedure documented here. So let's get this done! Display templates contain a "Label" - which is the text displayed next to the field, and the actual field itself which displays the data. The location of these objects on the actual form that's displayed to the user is also shown as X and Y co-ordinates. Next, locate the accompanying field at location X=259, Y=28 - it's an Edit field, and it shows the attribute ms-Exch-Mail-Nickname [screenshot]. You need to change this to the attribute "mail" - which is the default address of the recipient. Here's what threw me off - the UI doesn't list the ldapDisplayNames of attributes! The ldapDisplayName mailNickname logically maps to the ms-Exch-Mail-Nickname attribute. But I could not find anything in the list that would logically map to the "mail" attribute. I ended up using LDIFDE to dump the attribute with ldapDisplayName=mail - it is called E-mail-Addresses. Going by the name of the attribute, one would think this is for proxyAddresses - there's only one default email address that shows up in the "mail" attribute, and the attribute itself isn't multi-valued! So, let's go ahead and complete this by selecting E-mail-addresses [screenshot] instead of ms-Exch-Mail-Nickname. Once you're done, you can click on the "Test" button to see how it looks. You would need to make this change to other recipient types - like Group, Public Folder, and Contact. Alternatively, in the templates where you do see extra space, you could perhaps add these as additional fields if you still want to show the Alias. You create new Query-Based Distribution Groups but they don't show up in the All Groups address list in Outlook clients - cached mode or not. QBDGs are not really groups, as far as Active Directory goes. They're instantiated from a new class - msExchDynamicDistributionList. No wonder it doesn't pick up the QBDGs. To make QBDGs show up in the All Groups address list, you will need to edit the purportedSearch attribute of All Groups. - Fire up ADSIEdit and expand Configuration | Services | Microsoft Exchange | YourExchangeOrgName | Address Lists Container | All Address Lists. Now go ahead and check the All Groups address list in Outlook. If you're in Outlook 2003 Cached Mode you may need to download entire Address Book (uncheck "Download Changes since last update... "). Scenario: You’ve created a new user (or any Exchange recipient that should show up in Exchange Address Books/GAL), but the recipient does not show up in the GAL in Outlook. Are you using Outlook 2003/2007 in Cached Mode? If yes, login using Outlook Web Access and try to send the user an email. Does the name resolve? If yes, it’s most likely related to the Offline Address Book (OAB) not being updated. 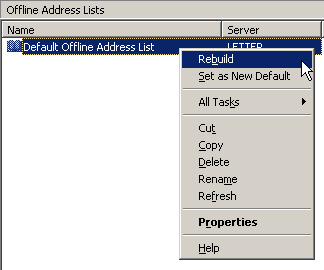 In Cached Mode, Outlook 2003/2007 clients use the Offline Address Book to lookup recipients. 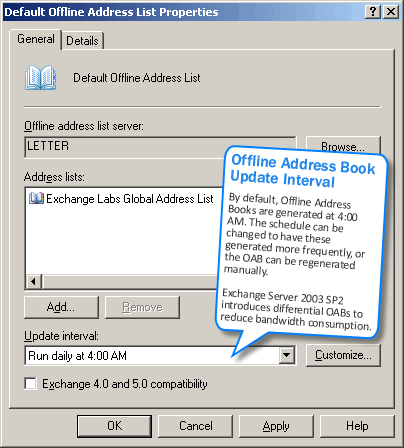 By default, Exchange generates the Offline Address Book once a day at 4:00 AM. New recipients do not show up in the OAB till Exchange updates it. Update-OfflineAddressBook "Name of Address Book"
- On the client go to Outlook 2003/2007 | Tools | Send/Receive | Download Address Book…. Modify the OAB generation schedule: The OAB update interval can be modified to have Exchange update it more frequently, depending on your environment. Alternatively, you can wait till after Exchange has updated the OAB. One of the more frequently asked questions in an environment where you want to host more than 1 company's email on a single Exchange server. Both companies have unique dns domains, let's say CompanyA.com and CompanyB.com. You typically end up locating thw users from the 2 (or more) companies in their own respective OUs. You go to Recipient Policy in Exchange System Manager to create a recipient policy that generates the email addresses for CompanyA, but there' s no option to be able to create a policy based on OUs! Unlike GPOs in Active Directory, Recipient Policy cannot be created base on OUs. Adding this feature would make lives of a gazillion Exchange admins easier, but the fact is you can't. So what are the options? 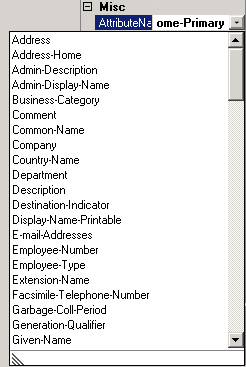 You could create the policy based on attributes like location, department, company etc. In this case, we will go ahead and create the policy based on the company attribute. This can be easily accomplished from the Recipient Policy GUI. 1. Go to the Recipient Policy container | right-click in the right pane where the default policy is listed | New | Recipient Policy. 2. From the New Policy dialog box, select the "E-mail addresses" checkbox to create a policy that generates email addresses. (The other option is Mailbox Manager settings) | click OK.
3.  Enter a name in the General tab of the policy - let's say "CompanyA Policy"
11. ESM will prompt you to update recipient's addresses. You can select Yes if you want to update immediately, or No if you are in a large domain where you want to schedule the update for later. Wait for RUS to run. If set to run all the time, you can check the users' properties to see if the intended recipients have the new email address. Repeat the procedure for CompanyB.com domain. 1. You can modify the Default Policy to use it for CompanyA.com, else the Default Policy will still apply if its conditions are met, and you may see email addresses that are not required for a certain set of users. 2. When creating a new user, you will have to remember to always populate the user's relevant attribute (company in this case) for the user to get the right email address.